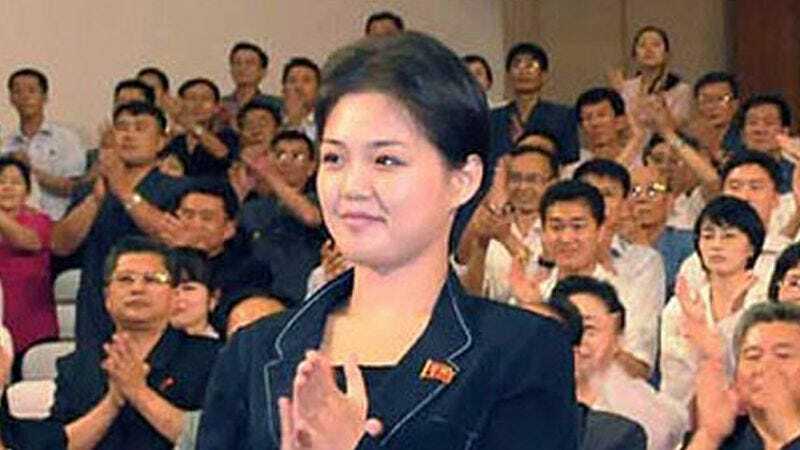 PYONGYANG—Ri Sol-ju, wife of North Korean Leader Kim Jong-un, opened up to reporters Thursday about her husband’s warmongering, saying that the Dear Leader’s recent bluster was totally uncharacteristic of the man she was forced to marry three years ago. “Since being ordered by my government to spend the rest of my life with this man, I’ve gotten to know him very well, and I can tell you that the Jong-un threatening nuclear war is not the same Jong-un who plucked me out of a parade and demanded I cut ties with my family,” said Ri, adding that she still believes the controlling despot who erased her identity and forbade her from leaving the residential villa is in there somewhere. “The man you see promising missile strikes on U.S. targets is not the person I was forced to fall in love with. And he’s certainly not the same father to the child I was forced to have with him. It’s upsetting to admit, but when I’m told to sit across from Jong-un at the breakfast table, I don’t even know who I’m looking at anymore.” When reached for further comment, North Korean officials said that Ri would be unavailable for the foreseeable future.